A ruckus is generally kind to Volatility. 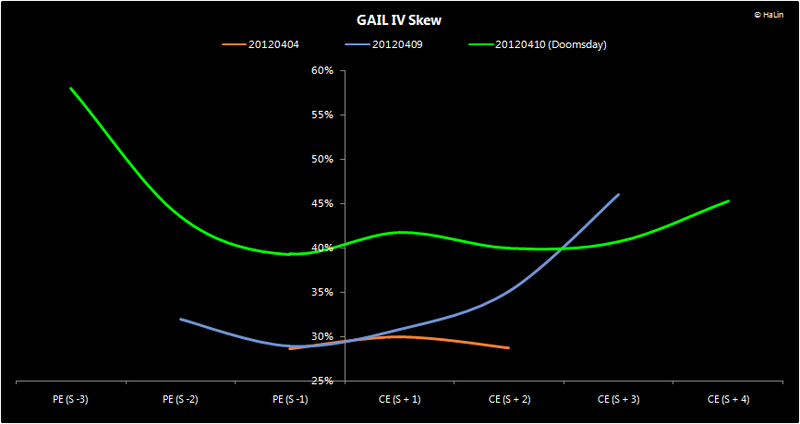 Natural Gas Implied Volatility, which was quite tepid since mid-March '12, spiked reacting to the adverse newsflow. 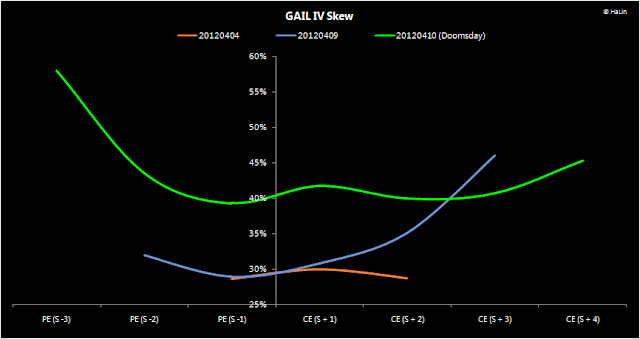 IV skews, which were flattish around the long weekend (April 4, 2012), have now turned into smirks as Puts have come into focus. The scramble for buying protection has pushed up Put prices. Spiking IVs offer attractive possibilities to deploying capital. 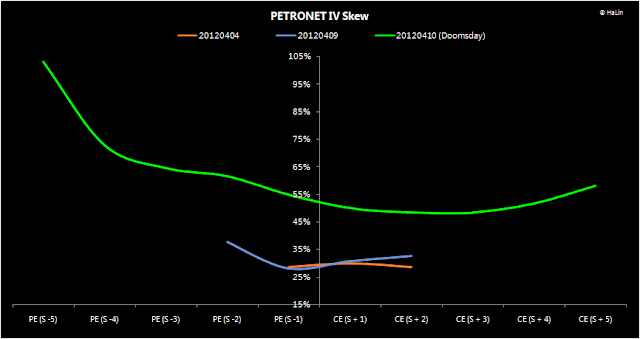 Petronet LNG (Bloomberg: PLNG IN, NSE: PETRONET) & GAIL (Bloomberg: GAIL IN, NSE: GAIL) IV skews paint an insightful picture. Though IVs have picked up across the board, OTM Put IVs particularly, have bumped up neatly and now offer a reasonable risk-reward. 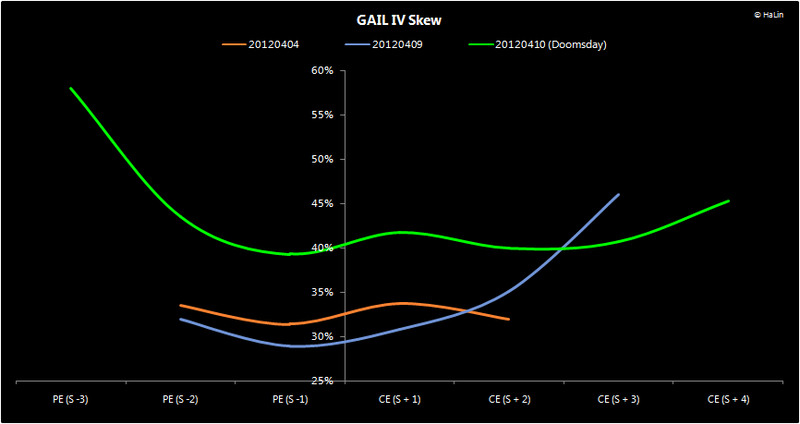 Queerly, skew was inverted going into the long weekend. Generally, lower liquidity in OTM strikes should impel Option Writers to demand higher compensation for assuming Gap Risk. Writers, however, seemed happy to assume risk for low, flattish skews. A long weekend brings its own advantages and disadvantages. The advantages gained through a Long Theta posture needs to be weighed against the possibility of Gap Risk, after the long weekend. As market participants process and assimilate developments materialising over the weekend, the chances of a Gap Open (up or down) becomes likely. One way of somewhat mitigating this risk while enjoying the benefits of time decay is to demand higher IVs. The other is to own cheap protection at low IV. The Natural Gas pack is hounding the Longs today. The next few days will be interesting indeed.